This computer was a long time in the making, and it is a bit old now. I finished it in Feb 2016, after almost 2 years of planning, waiting for good prices on parts, and building it. The only things I paid full price for in this build were a few of the radiators. Several iterations were needed so that I had a computer to use while I was waiting on more parts. I did not pay full price for many items in this build, and found many parts on kijiji, eBay, and from overseas much cheaper than their list prices. Getting these prices on some parts is not something that you will find everyday. I spent over a year just gathering parts for this build. If you take your time and do your homework, you should be able to find some amazing prices on quality components. I initially got a 6 core Intel i7 5820K from microcenter. One of my friends was driving through the US and was able to pick this up for me. Even with the exchange rate, it was still a lot cheaper than buying one in Canada at the time. I used this the first iterations of the build. While browsing kijiji a while later, I saw a 12 core Xeon E5-2658 V3 for sale at $300. I could only find information for this on the intel website, and a few Chinese eBay sellers selling it, so it is probably an Intel engineering sample. It works great, and I love seeing how fast Cinebench runs! The only drawback to this beast of a CPU is its low clock speed, giving lower single thread performance, though for $300, it can’t be beat. I even sold the 5820K and got around $350, so I basically got $50 to get a better CPU! 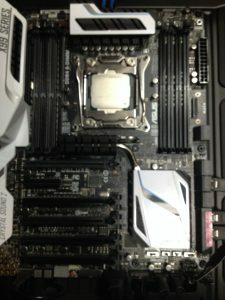 I found an AsRock X99 WS board on eBay for a good price, and jumped on it. This basically chose my color scheme for me as it was blue, and did not fit with many other components. The first iteration had a black and blue color scheme, but it did not turn out as nice as I had hoped. My next board was an Asus X99 Deluxe that I found for $250 on Kijiji. The black and white color scheme would allow me to go for any color if I added some RGB LEDs, so that’s what I did. 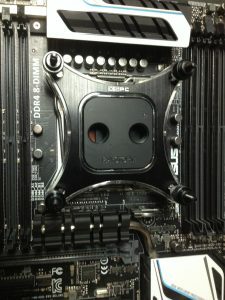 I designed a custom cover that goes around the waterblock to hide some of the silver capacitors around the CPU socket. I started out buying 8GB of Crucial DDR4 when it first came out, and paid around $130 on Newegg for it. Later on when I upgraded my CPU, I also bought another 32gb of RAM in a 2x8GB and a 4x4GB lot for a total of around $120. Trying to get all my sticks recognized was not going to be possible, as they were all different capacities, so I installed the 4x4GB sticks for 16GB, and used the other RAM in other computers. I salvaged some black heatsinks from an old set of Corsair DDR RAM, and attached them to these sticks that do not have heatsinks. I started out with a single 500GB Seagate drive from my old computer, but found a listing on kijiji for some 2TB WD4 drives for $50 each. I bought 2 and put them in RAID 1. I designed and 3D Printed some custom brackets to mount behind the motherboard tray in the extremely spacious NZXT Phantom 630 that I have. Temperatures have not been a problem. One of the original drives failed after a year and a bit, so I bought another 2 2TB drives on eBay for around $100 again. Repairing the RAID array was not a problem, just a simple case of firing up Intel Rapid Storage Technology. I have 2 Avexir 256GB Sata SSDs that I got for around $75 each from NCIX back when it was still around. I designed another custom 3D Printed bracket for them and put them in RAID 0 for extra speed. They have served me well, and are nowhere near full yet. The 1300W EVGA G2 power supply that I won on eBay for $125 was definitely a steal. It had previously been used for bitcoin mining, but a beast like this should be able to handle it without a problem. 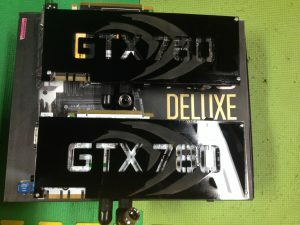 This was one of the best and most powerful power supplies out there, and had a great review by johnnyguru. The 2 GTX780s that I have in this system are getting a bit outdated now, but remember, I built this system in 2016. I got one of them at CanadaComputers on clearance sale, and the other one on Kijiji. The backplates on them are custom-cut on an Epilog laser cutter out of 2mm acrylic. I designed them in inkscape – an amazing and free 2D Graphics software. 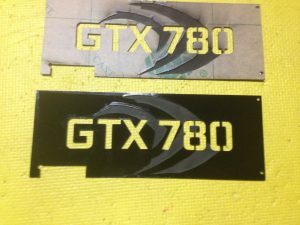 The letters are vector cut, and the NVidia logo was raster engraved. The liquid cooling in this was a fairly long process. I ordered components from Aliexpress, and found a lot of EK fittings for an amazing price on Kijiji. This bag of fittings was ultimately what influenced me to go with hardline tubing in this build. The GPU waterblocks are universal blocks that I ordered from Aliexpress, and have served me great. I don’t game at all, so they are not under heavy loads much, if at all, so these are perfectly fine (and a whole lot cheaper than full cover blocks). I added some small aluminum heatsinks on the VRAM chips, and an 80mm fan blowing on the power delivery section of the card. Through a bit of trial and error, I was able to power them from the original fan headers on the boards. As for radiators I have a 360mm, a 280mm, a 240mm, and a 120mm radiator. I believe all the fan slots on my NZXT Phantom 630 case are taken up with radiators. This is way more than needed to cool all the components in this PC, even if they were overclocked. I went for this overkill setup because I thought I would be upgrading and overclocking within a year, but clearly that did not happen. The pumps in this build are 3 12V 18W pumps from Aliexpress, controlled with PWM from an Arduino with MOSFETs. This board also controls the LEDs in the computer. 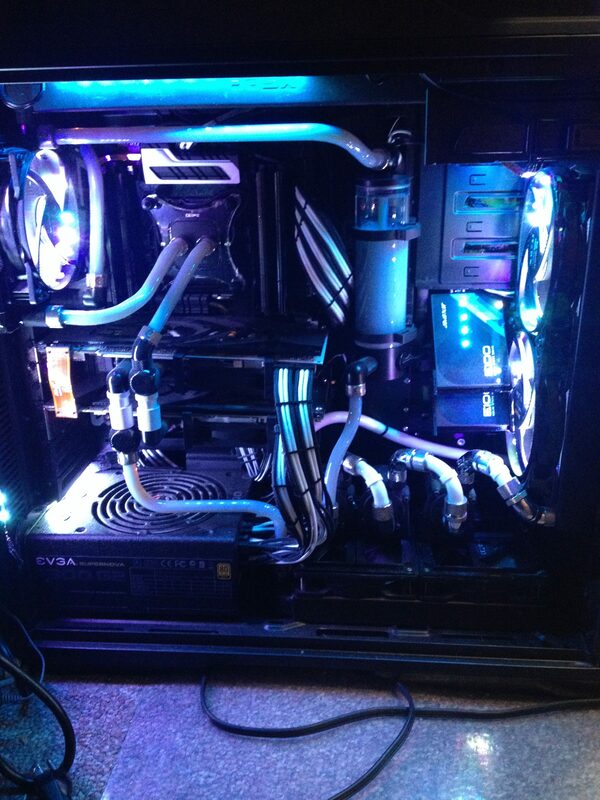 All the pumps are mounted on some custom 3D Printed brackets sitting on top of the lower 240mm radiator and fans. This was not my first liquid cooling adventure, and it certainly won’t be the last. Pretty much all the cables in this build are custom made and sleeved. 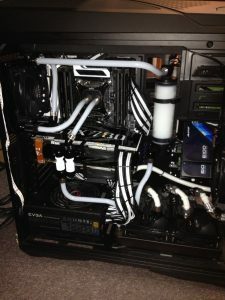 It was quite interesting to find all the required connectors for this build. 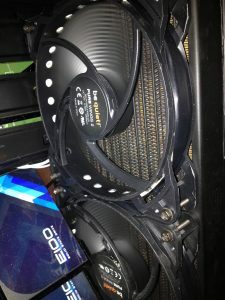 I had to buy some adapters on eBay just to get the connectors – SATA, and 6/8pin graphics card connectors specifically. To get an 8 pin ATX power connector for the motherboard, I had to buy a lot of 50, but it was only about $6. If anyone needs an 8-pin ATX plastic housing, let me know. I also had to find pinout diagrams for my power supply. The first time I sleeved power supply cables, I went for paracord sleeving. This time, I went for the more standard plastic sleeving, and I’m glad I did. It was so much easier to work with. 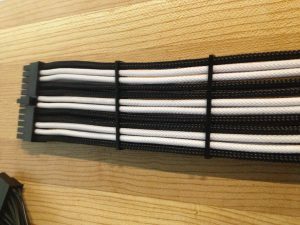 I used black and white sleeving that went over black and white 16AWG wire from eBay. Crimping the ATX connectors on took a bit of practice, but I eventually got the hang of it. One of the quirks of the power EVGA 1300 G2 power supply that I have is that it has capacitor on the cables. Finding the right wires to put them on was a pain, especially given the limited documentation (at least at the time). 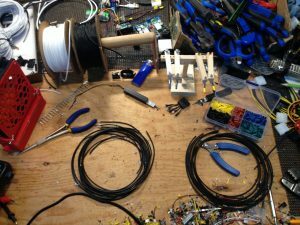 Building these custom cables took over a week’s worth of time. I also laser cut some cable combs out of black acrylic to keep everything looking nice on the front side of the case. As you might expect, I did have to cut a bit out of the case as well. The original DVD drive bays blocked part of the window, and stopped me from mounting the 280mm higher up than it was supposed to go in the front of the case (to allow room for the power supply and 240mm rad in the bottom). With the help of a rotary tool, those came out, and I repainted the edges with some simple black acrylic paint. I can hardly notice that anything was cut until I look pretty closely. On 3 of the fans in this build, I made my own LED rings. I popped the fan blades out and drilled holes around the edges to match up with the LEDs in my RGB LED strips. They turned out really well. I made a custom Arduino control board for my pumps and LEDs that is able to control pump speed and will cycle through the RGB color spectrum fairly slowly. As I mentioned at the start, this is now over 2 years old and needs a refresh. 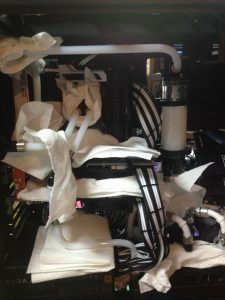 I still have not changed the coolant, and have noticed that it has lost its milky white color – it is now more of a light gray. I have absolutely no idea how much time I poured into this computer, but I have to say, the end result is simply amazing.